Terence P. O’Halloran is a Chartered Financial Planner and retired Independent Financial Adviser with 44 years experience in the financial planning profession. He established his practice in Lincoln in 1970 and it has steadily grown since then and his retireing in 2014 . Early in his career he realised that there was a serious need for anglicised technical books that were both easy to read and understand. His first venture – ‘You Sign a Little Cheque We Sign a Big One’ – was so successful that very quickly this was updated to ‘You Sign’. 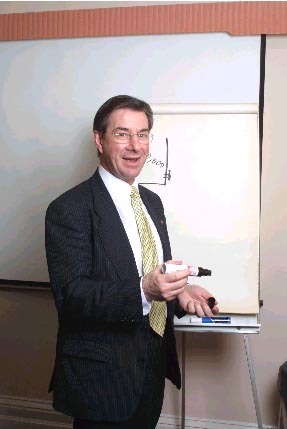 Soon other professionals began to experience and benefit from the writings of Terry O’Halloran and it was not long before he undertook his next venture, ‘Mountains Out Of Molehills‘, for communicating technical concepts. Terry has always made full use of his experience and this can be seen by his prolific use of actual cases. With ‘Mountains Out Of Molehills’ the emphasis is focused upon taking the complex and presenting it in a simple , understandable form which is the hallmark of Terry’s professional success. The methodology is used throughout the book to make the reading and understanding much easier. More recent publications are – “Trusts’ – A Practical Guide”, an acknowledged ‘Must Have’ volume, for anyone involved with life assurance ,pensions and capital investments. His later book “If Only Politicians Had Brains”, sets out to explain some of the more bizarre, disastrous or plain ineffectual regulatory interferences that rule all of our lives, and is another hit with his readers. Terence is a prime mover in the formation and running of Mentoring Groups and Breakfast business clubs of 8 to 20 members. They are extremely effective ‘best practice’ forums and are described in detail in ‘Building a Business on Bacon and Eggs’. The philosophy has built Terry’s businesses, particularly in reputation for quality work. ‘Hindsight – The Foresight Saga’ is the culmination of years of dedication and research that opens the eyes of the reader to the marvels of the markets and the secrets of their ability to provide a constant growth pattern over time. More details of all the books can be found at Life publications own web site. A gifted public speaker and lecturer, Terry has presented seminars and workshops to a wide range of specialist and “lay” audiences around the world. He has also been a main platform speaker at the annual conferences of the Life Insurance Association (LIA) and Insurance Institutes, The Life Insurance Round Table of India and The Million Dollar Round Table to name a few. Terry’s books and DVD presentations have inspired many in the pursuance of their professional dreams and he can, perhaps, through his publications, inspire you also.